Let’s start with the history of coups in Turkey. Traditionally, they have been conducted by the military, which modern Turkey’s founder Kemal Ataturk designated as the guardians of secularism, stability and integrity. Since WWII, there were military coups in 1960, 1971, 1980 and 1997, and the US was behind EVERY one. The coup in 1971 was similar to the one in Chile that happened a little later in 1973, and which was also organized by the CIA. The goal was to stop the country from sliding « to the left » under politicians who held social values. The 1980 and 1997 coups were also conducted with US blessing. Did Turkey’s foreign policy change after the military came to power? No, Turkey was a faithful vassal of the US and remained pro-American, with all attempts to change that policy severely punished. It’s important to understand that the US has been behind all Turkish coups, in order to understand that country’s evolution. The Turkish army is an experienced coup maker. They can teach anyone. The idea that it is they who guarantee stability and secularism is imbibed with their mother’s milk. 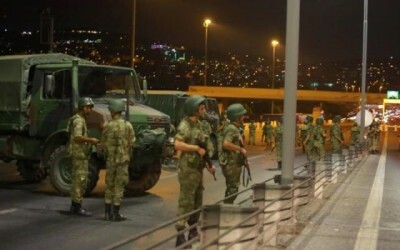 Military men in Turkey have never failed in a coup – until now. Why did this happen? Perhaps the military men did something wrong, forgetting the playbook? It’s important to see that actually, they did just as well as their predecessors. So why did the coup fail? It failed because it was expected. Erdogan was ready to deflect it. To understand what just happened in Turkey, we need to remember little-known pages of our own history: the USSR, 1927. Trotskyists attempted to take power on the tenth anniversary of the October Revolution. The plan for this « coup » by « Lenin guards » was to occupy « telegraph and telephone » and arrest Stalin and his supporters, taking advantage of the festive demonstrations on November 7. Stalin was aware of the plan and ensured the coup would fail, leaving the Kremlin with his supporters for a safe place; the major buildings were occupied in advance by loyal chekists, who barricaded themselves in. As a result, when on November 7, 1927 gunmen broke into the leader’s apartments, no one was home. When they tried to force other major buildings, they also failed. As a result, the putschists found themselves on the street where workers were marching to celebrate the red-letter day. Attempts to stir up a rebellion on Red Square and other places failed, and the coup with them. Why did Stalin, being aware of the coup, let it happen, lancing the abscess? To show the Bolshevik Party that there really was a threat and begin purging it. If there had not been an attempted coup, Trotsky’s expulsion from the Party would have been considered by the rank and file as tyranny, a settling of scores with those who disagreed with Stalin. They could have different points of view, so why did he need to arrest old Party members? Lev Davydovich Trotsky was Lenin’s closest associate, founder of the Red Army. Stalin played with fire, showed his face to the « opposition », and the whole party followed him. Trotsky was expelled from the party, and afterwards sent to Almaty, and then to…Turkey. Something similar happened in July 2016 in Turkey. The coup failed because Erdogan knew beforehand what was being planned, and prevented it. Almost none of the buildings from which they could announce they had taken power (parliament etc. ), were occupied, facing armed resistance. The response was so well prepared that they had to bomb the parliament building. The resistance led to many casualties among the putschists. This had never happened in Turkey. The military had always successfully taken a defenseless power. The next question we need to ask ourselves is how the Turkish leader was informed about the the conspiracy in the making? 1. Turkish special services. They would not warn anyone, and it’s unclear whose side they are on. 2. The US warned Erdogan. The United States is always behind the military who try to take power in Turkey. Turkey never tried to leave NATO, always remaining loyal to the US. To undertake a coup without Washington’s green light means failure. Considering who else could help Erdogan, there are not too many intelligence services in the world – serious ones, that is. Mossad? It’s a branch of the CIA; besides, Israel does not pursue policies contrary to America’s. And why should Israel help the Islamist Erdogan? MI6? Again, it’s practically a branch of the CIA, given the common US-British foreign policy. France or Germany? The first cannot even defend itself. The second doesn’t really exist on a global scale. Who else? China? This is not its game at all and Erdogan is by no means “their type”. Is Erdogan Russia’s friend? Of course not. He is our enemy. But today he is mad at the US. And « the enemy of my enemy is my friend ». For Russia, an Erdogan who is mad at the US is much preferable to a pro-American, unpredictable military in the Syrian war. At least now, Erdogan owes us, and the putschists owe the CIA. This opens a new window of possibilities for us in the complex game of international politics.